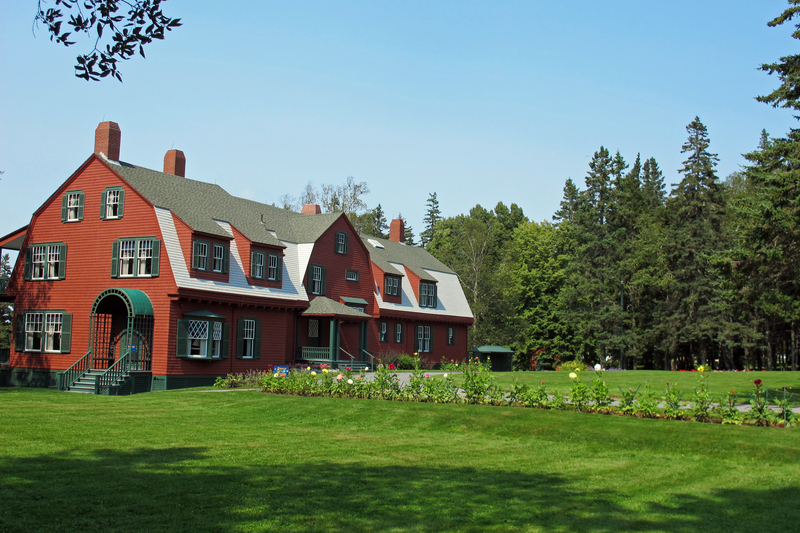 It’s no wonder that President Roosevelt called Campobello “My beloved island,” and returned to vacation there summer after summer. Leaving the Downeast Maine town of Lubec and crossing the FDR bridge over Johnson Bay, you reach Canada’s New Brunswick province and Campobello Island. After stopping at the drive-in Canadian customs and immigration, continue to the Visitor’s Center on the right. It has a wealth of maps and information and WIFI. The southernmost part of the almost nine mile-long island is the 2800 acre Roosevelt-Campobello International Park, proudly heralded as the only international park in the world, managed by two countries, Canada and the USA. It has several trails for hikers and gravel road for cars. Hikers and bikers beware—you share these with cars and the dust clouds are fierce. On the eastern shore of the park, you’ll find Herring Cove, a beautiful black sand beach and a golf course, started by FDR. South of Herring Cove you find the also magnificent Racoon Beach, its shore not sandy at all but full of Maine’s smooth granite rocks. The views from every road and at every turn in the island are beautiful, a continuation of the rugged coastline that is so unique to the northern US, rocky with pines. Roosevelt’s presence looms large and his thirty four room “cottage” is open to the public, preserved pretty much as it was when the Roosevelts and their brood lived in it. Son Franklin D. Roosevelt Jr. was born there. And yes, FDR and wife Eleanor did share a bed, their bedroom with a double bed, is intact. Knowledgeable guides stand around different rooms to enlighten you and “Tea with Eleanor” where stories about the First Lady are accompanied by tea and cookies is free, twice a day, reservations available on line. At the northern tip of Campobello sits unique Head Harbour lighthouse, which can be reached only at low tide—twice a day. It sits surrounded by the strong current of the Bay of Fundy and the tides around the lighthouse rise five feet an hour. A story is told of a couple who attempted to cross while the water was ankle deep only to be swept away to sea. Of course, I had to face the challenge and cross. Neglected for many years, Head Harbour lighthouse was lovingly restored by a group of less than a dozen volunteers, an example of human persistence. They scrapped and painted and collected funds for the major repairs. The volunteers still work on the project and refill their budget by charging $5.00 admission. Whale watching is another fun way to spend a few hours and whales, seals, porpoises and eagles provide entertainment during the outing. Captain Riddle ends his tour with a bit of fishing from his boat. Campobello has two restaurants, Family Fisheries and the Herring Cove Golf Course restaurant. Jocie’s Porch is an excellent coffee house—no food, just coffee and blissful moments sitting on of the swings of its placid porch with a cup of java inscribed, “Where Friends Become Family,” overlooking the ripples of the ocean on Friar’s Bay. Places to stay are not plentiful, only the nineteenth century Owen’s House, Friar Bays Motel and Whale Watch Motel, which ironically has no view to watch whales, just the road. Housekeeping cottages: Pollock Cove Cottages and An Island Chalet. Rental homes are available. Basic food supplies and sandwiches can be handled by the Village Mart, where you will also find a drugstore, but beware, no gas station in Campobello, you have to cross back to US soil in Lubec, where there are also large supermarkets, and several good restaurants. Cell phone is erratic at best. In the same spot you can get reception from an American tower and five minutes later from a Canadian one. Friendly advice—turn off that roaming, because Campobello is for unwinding, relaxing, and appreciating nature.